Merchant fatigue: the phenomena of San Francisco local businesses getting hit up by so many daily deal sites, customer loyalty programs and other startups that the store owners and staff are just plain tired. It’s one reason that entrepreneur launched his latest local startup MyTime in Los Angeles first. Personally, I think of those window stickers (“Customers love us on Yelp”), countertop signs and POS systems similarly to stenciled bomber plane art – each one represents a startup marketing manager or inside sales dude winning a small battle for attention. Despite all the noise about the local vertical, it feels like I rarely see the press actually ask a business owner about their tech usage and needs. We get relatively breathless coverage of how Startup X is going to disrupt something, but the person behind the counter who owns the purchase decision receives zero column inches. Someone needed to right this wrong (or err, write this wrong) and I was up to the challenge. Also, the SF bakery I visited has really good gluten free coffee cake. While Flour & Co might be a relatively new store having opened just this past spring, owner Emily Day isn’t a beginner. Having previously run store operations for La Boulange, Emily helped take the brand to 13 stores (and five more planned) before leaving prior to the Starbucks acquisition. With a background in both accounting and restaurant management, she knows how to count the chips and bake them into cookies [that’s a horrible line, I know, sorry]. Despite her pedigree and experience, Emily still uses a good amount of intuition, not just data, when making decisions for her brand. For example, the Nob Hill location sprang not from a Google Earth mashup of demographic survey data, but her own understanding of the changing neighborhood and how a new Trader Joes on the same block was likely to influence foot traffic. 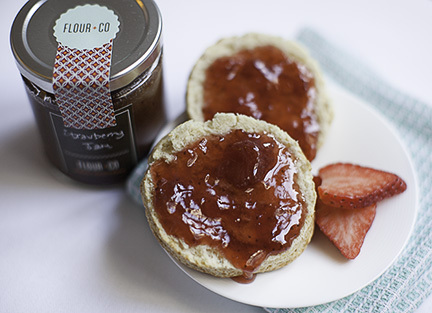 Today Flour & Co is a single shopfront but Emily has her eyes on distribution via other local retail, catering and more locations in the Bay Area. Here are some snippets from our conversation, greatly paraphrased as my hands were more consumer by said coffee cake than capturing direct quotations. Interoperability between store tech is still a mess: Emily uses ShopKeep as her tablet point-of-sale system because it’s the easiest and most flexible in her opinion. Some of the other systems she tried had fatal flaws, such as an inability to print order tickets into the kitchen. She’s also really sensitive to minimizing the number of finger touches it takes to complete transactions. They’re a high volume business and during peak hours need to still provide quick service. Enter once, re-enter everywhere: Given POS as center of a retail store, you’d imagine that it would link seamlessly with all her other systems. Nope. Across the different providers there’s still a real lack of interop – sometimes because tools are new, sometimes because no API exists. Flour & Co wanted to use LevelUp but it doesn’t integrate with ShopKeep, so nope [edit – it does integrate but Emily tells me requires a keyboard which she doesn’t have room for on the counter]. Similarly there was a preferred vendor with an app which allows users to order ahead before they reach the store but no ShopKeep integration so, again, out of luck. There’s so much other work to do that once Emily’s made a system choice, she doesn’t want to go back and reevaluate so since POS came first, compatibility with ShopKeep drives a whole bunch of other decisions. Emily wants to find a loyalty program but so far none of them work well with her other platforms. No one ever got fired for buying IBM: The large well-known guys still have lots of customers. She knows about Xero accounting and the wave of online pay systems but uses Quickbooks and Paychex for now. It works for her and that’s good enough. Startups, your competition is sometimes a spreadsheet: At La Boulange they used shift scheduling software but for now at Flour & Co, Excel working just fine. Thankfully though, customer mailing lists have migrated out of the xls and MailChimp powers her communications. Wants to do her own research before talking to a salesperson: Technology recommendations come from her own research and other store owners. Easy, simple comparison charts and good clear sales marketing pieces are what Emily wants to see; not a salesperson trying to get on her calendar for a 30m demo. What comes next for Emily? Probably an online store via Shopify for some of her more popular items that can transport well. Pingback: Boxers Not Briefs – Interoperability – One Ring To Rule Them All?